Tangled and True: kids crafts. Having been on bedrest for the last 5 weeks has left my girls stir crazy and me out of ideas. I am on the lookout for easy (toddler friendly) crafts and activities to keep them occupied and not feeling like they are missing out on summer fun. Ideas and tips are greatly appreciated. Lifesaver craft jar available here. It's worth every penny. picture collages. clip pictures from magazines, give your kids a glue stick, and then let them arrange on construction paper. super easy. we have the i'm not bored anymore art jar at our house . . . and my 3 girls will sit at the table for hours with it! they absolutely love it! definitely is worth every penny! puppet shows are lots of fun for my girls as well! i really enjoy this email/website/listserv i heard about from a friend: www.kidscraftweekly.com. 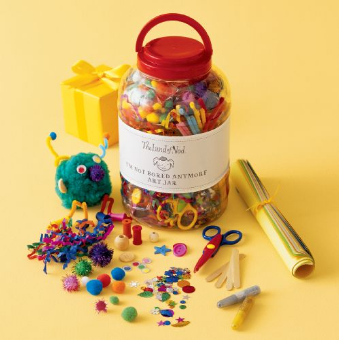 although it says weekly, every 2 weeks the author sends out an email with loads of ideas for fun, creative, and easy crafts (for differing ages as well). my 4 year old daughter and i have had loads of fun so far.